Paul on the other hand, has a grown-up aversion to tofu. Whenever I cook with tofu, he expresses a strong concern that I am covertly working to turn him into a vegetarian, his own personal horror! Despite himself, Paul scraped his bowl clean and gives this dish two thumbs up. This recipe is adapted from David Lebovitz, Linda Ziedrich, and Joe Yonan. The first step is to press the moisture from the tofu to allow for a firmer texture and better marinade saturation. Sandwich the tofu between cutting boards with plenty of paper towel on either side of the tofu to soak up the water that squeezes out. Place heavy items (such as canned food) on top of the upper cutting board. Let this strange looking monument stand for 30 minutes to press the tofu. Whisk together the ingredients in the tofu marinade (sesame oil, soy sauce, water, garlic, ginger, hoisin, cayenne and salt), and pour into a large container that can accommodate the tofu pieces. Remove the tofu from the press, and add to the marinade. Refrigerate the tofu for at least 1 hour. Time to pickle your vegetables. Whisk the pickling liquid ingredients (salt, soy sauce, rice vinegar, water, ginger, sugar) together. Divide pickling liquid into two bowls. Put carrots and radishes in one bowl and beets in another (to keep everything from turning red). Allow the vegetables to sit in the pickling liquid for 1 hour. Remove the tofu from the marinade and spread out on a cutting board. Save the marinade to serve over rice as a sauce (if desired). Dust the tofu with corn starch, coating both sides. The easiest way to do this is to dump the cornstarch in a mesh strainer and tap the strainer to dust each tofu piece, this allows for a more even and thin coating. Line a baking sheet with parchment paper or a silicon mat and place the corn starched tofu pieces on the baking sheet. Bake for 45 minutes, flipping the pieces mid-way through cooking and rotating your baking sheet as necessary to ensure even browning. Remove from oven when your tofu looks golden brown and delicious. 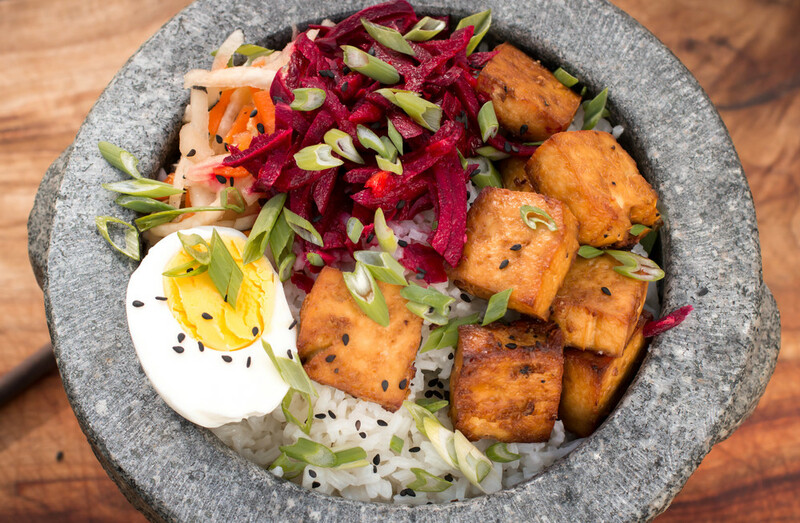 To serve, fill bowls with rice, top with baked tofu, eggs, pickled vegetables, green onions, sesame seeds, and reserved marinade/sauce.